The Summoner in “The Friar’s Tale” in Geoffrey Chaucer’s The Canterbury Tales is an example of a religious figure who abuses his power and leads a secretly sinful life. The Summoner ultimately makes a deal with the devil that ends with his descent into hell. The point of the tale is to paint summoners in an unflattering light and reveal their hypocrisy. Summoners wouldn’t have been very popular figures in the Middle Ages due to the fact that they got people in trouble for committing sins. This tale has multiple implications for the modern day, especially as it relates to modern day business ethics. In the illustration of a summoner below, from the illustrations in the Ellesmere manuscript, the summoner looks shifty, slightly hunched and carrying a coin purse that hints at his greed. Even his horse looks sinister, seeming almost cat-like in its posture and holding its head low instead of proudly. 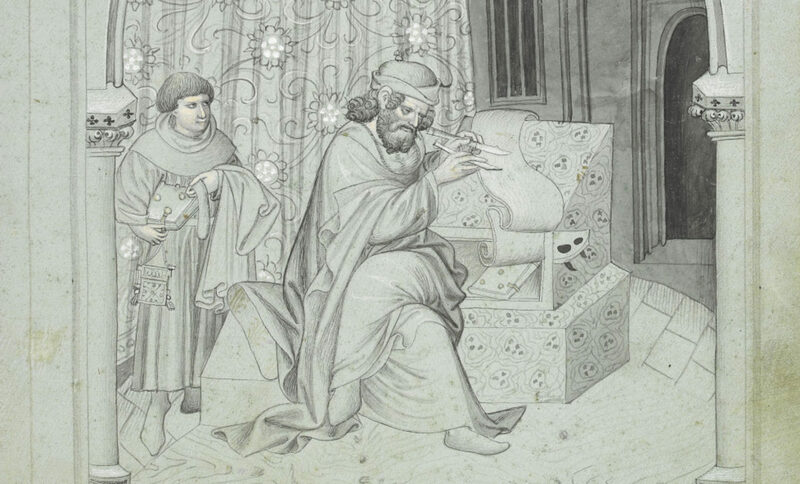 This illustration very much aligns with the behavior of the Summoner in The Friar’s Tale. The tale itself describes how the Summoner uses spies saying, “as any hauk to lure in Engelond,/ That told hym al the secree that they knewe./ For hire aqueyntance was nat come of/ newe./ They weren hise approwours prively (lines 1340-1343),/” which means that the Summoner uses these spies to gather information on citizens. The tale then describes how he uses these secrets to blackmail these people saying, “He took hymself a greet profit therby./… He koude somne on peyne of Cristes curs./ And they were glade for to fille his purs (line 1344, lines 1347-1348).” This line describes how the Summoner uses these secrets, not to promote good and lessen sin, as you would think would be the role of a religious figure, but to “fille his purs” and profit at the expense of others. A lesson in business ethics that can be taken from this moment in the tale is the performance of immoral acts under the guise of morality. The company Healthgen grappled with this issue as one of its senior managers, Filip Kowalski, made a donation to a client’s private foundation. The question surrounding this transaction was whether it was charity or bribery. The description of the case on Harvard Business School’s publishing website states, “After a natural disaster, Healthgen- at the request of the director- donated products to help during the crises. After Healthgen wins an important contract, the media alleges that the donation was made to secure support of the regional health director. Were the efforts to boost company sales and support public health a donation or a bribe?” Although Healthgen probably had better and less damaging intentions than the Summoner in the tale, the Summoner was using his religious duty as a means to gather money by blackmailing and spying, doing “good works” by catching sinners through nefarious means. Healthgen was donating to charity while simultaneously gaining unfair advantages on competition. Therefore, The Friar’s Tale is relevant to today in that it has lessons wrapped into it, such as associating with reputable institutions and not having ulterior motives when doing good works, a subject similar to the one Zach Prephan deals with in his discussion of the Pardoner and modern day Wall Street. Later in the tale, after the Summoner enters into a business deal with the devil, he is eventually taken straight to Hell. The devil states, “Thy body and this panne been myne by right./ Thou shalt with me to Helle yet tonyght,/…And with that word this foule feend hym hente./ Body and soule he with the devel wente (lines 1635-1636, lines 1639-1641).” Here, although the devil only laid claim to the Summoner’s body, the Summoner also gave his soul to Hell by participating in immoral acts. This warning not to participate in unethical business transactions with unethical parties has contemporary relevance. The business Chiquita Brands learned this when they paid off terrorists to protect employees in Colombia. A description of the case on Harvard Business School’s Publishing website states, “The Justice Department began an investigation, focusing on the role and conduct of Chiquita and some of its officers in this criminal activity. Subsequently, Chiquita entered into a plea agreement that gave them the dubious distinction of being the first major U.S. company ever convicted of dealing with terrorists, and resulted in a fine of US $25 million and other penalties.” Although this case was complicated as it was dealing with the safety of its employees in a foreign and politically turbulent zone, Chiquita still suffered damage from its association with “devils,” or immoral individuals. The Summoner in The Friar’s Tale is ultimately a warning against living a monetarily motivated life at any cost, which will inevitably lead to sin, poor decisions, and a downfall. The Summoner’s immoral business practices led to an unfortunate fate, much like many businesses today that suffer for their poor ethical decisions. Ultimately, The Friar’s Tale is a commentary on the hypocritical life of the Summoner and is meant to expose what is believed to be the nature of summoners in general. Chaucer, Geoffrey. The Canterbury Tales . Edited by Robert Boenig and Andrew Taylor, second ed., Broadview Editions, 2012. Soltes, Eugene, and Brian Tilley. “Charity or Bribery.” Harvard Business School Publishing, Harvard Business School, 13 Dec. 2017, cb.hbsp.harvard.edu/cbmp/product/118052-PDF-ENG. 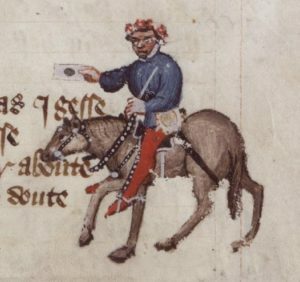 “The Summoner on Horseback.” Alamy, 1343, Lebrecht Music and Arts Photo Library, http://www.alamy.com/stock-photo-geoffrey-chaucer-s-canterbury-tales-the-summoner-on-horseback-english-83358508.html.